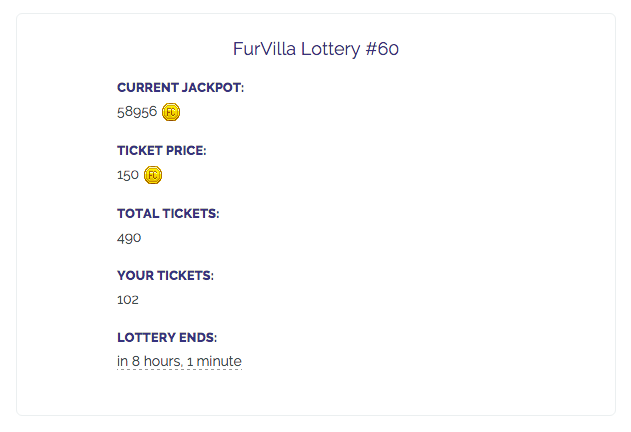 The Furvilla Lottery is a daily event where you can buy tickets and win FC! The lottery page can be found in the Town Hall. 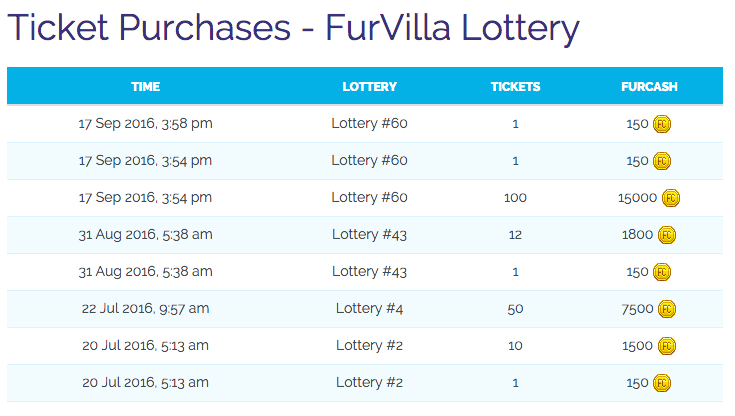 Since the lottery is a daily event, each round ends and starts at 12:00 AM Furvilla time. Each lottery starts with a 10k FC pool. Two-thirds of the FC from purchased tickets goes to the jackpot. Tickets cost 150 FC each, and you can buy however many tickets you want. Note: However, the dropdown menu only lets you purchase 100 tickets at once. There are two buttons at the top right corner of the lottery page. "My Tickets" is a list of all the tickets you've bought from all rounds, and "Lottery History" is a list of all rounds and their stats.